Your June Irish Eyes is been hurriedly written on the last day of May in the Culture capital of Ireland. I’m on my annual pilgrimage to Listowel Writers’ week. It was formally opened on Wednesday night by the President of Ireland, Michael D. Higgins. The president is a poet, writer, academic, and human rights advocate. He has been described as, “ . . . promoter of inclusive citizenship and champion of creativity within Irish society”. The president ( having tapped his feet to the music of Aoife Ni Argain , a senior All Ireland Harpist champion. ) gave a wonderful speech In which he payed tribute to the literary tradition of Listowel. He said that "Writers' week doesn't have to try too hard . . . Writers' Week is to Listowel what the Spa is to Lisdoonvarna." He spoke of how the Writers of Listowel John B. Keane, Bryan McMahon et al had an, "Unparalleled gift for developing characters." The President then presented the John B. Keane Award (A lifetime achievement award cor contributions to the Arts) to Anthony Cronin. Entertainment was provided by Claire Keane, a local girl who won the Voice of Kerry in 2001 and Aoife Ni Argain. The Chairman, Sean Lyons, gave a riveting speech in which he told us how the dedication of all involved in Writers' Week since 1971 has , “ . . . echoed down the corridors of the decades." and how he shares every moment with us as we enter the fifth decade of the celebration of the written word that is Writers’ Week.” The opening ceremony included the presentation of the writers Week Literary Awards. Christine Dwyer Hickey won the Kerry Group Irish Novel of the Year Award which includes a cash prize of €15,000. It was a long night in Listowel. Today started early with a Literary Walking Tour where we walked in the footsteps of the late, great John B. Keane. We visited his birthplace and the schools he attended with a flavour of his writings through song and story along the way. It coincided with readings from the winners of the writers’ Week Literary Competitions but one couldn’t be everywhere. Orla Tinsley, who received the Rehab Young Person of The Year Award in 2008, was in the Listowel Arms at noon. There was a medley of the early works of John B. Keane in St. Johns at 1.00 o’ clock followed by an interesting session with novelists Belinda McKeon and Aifric Campbell in the Plaza Centre. Just time for a quich snack before going to the Listowel Arms for a "conversation between John Lanchester and Colm Toibin. Back to The Plaza C to hear Helen Dunmore author of "Zenor in Darkness" and seven other novels. A later interview will feature the two funniest men on the island when journalist, broadcaster and Public speaker Billy Keane interviewed Des Bishop. Another Walking tour tomorrow morning followed by “The Virgin ant the Vulture” , written by and starring Shadaan Feifeli, at 2.30 in St John’s Art Centre, there will be “Writers from Three Continents” at 2. 30 and at 3.00 o’ clock “Poetry Without Pints” hosted by John McGrath, in the Seanachai Centre. Later in the day acclaimed novelist Christine Dwyer Hickey will read and discuss the Creative Writing Process in St John’s and at 6.30 we saw, and heard, two established Australian poets Paul Hetherington and Petra White. In between there will be a number of Book-launches and fringe events to attend; A Press Photographers exhibition and two Art Exhibitions. “Poets’ Corner” an Open Mic session will finish off the evening. It has been said that a Storyteller can’t afford the luxury of an ordinary life. Maybe he can’t afford a Sheanachai’s costume either but I had most of one. I was missing the “Grandad Shirt” but Lee Valley Original Irish Country Clothing, Inchigeela, County Cork (www.levalleyireland.com) came to the rescue. I’m now a fully attired Irish Storyteller. 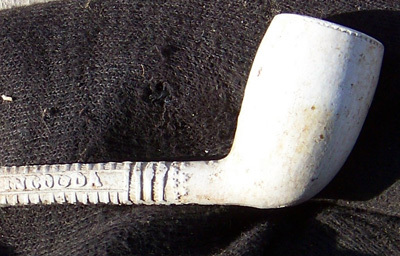 For the story I’m telling I needed a prop, a traditional Irish Clay pipe. Where would I get one of them?. The Penn Valley Pipe Shoppe in Appalachian, New York, makes such a pipe. And the very agreeable proprietor one K. C. Ellis fixed me up with the appropriate prop. It's exactly ten years since the great John B. Keane died during Writers' Week. Fifty years ago in a collection titled "Strong Tea" he published a collection of essays about all kinds of food from "Owl Sandwiches" to black pudding. And guess what? There's a special Writers' Week menu available in John B. Keane's. (There are no Owl Sandwiches available.) And do you know what I'm going to tell you? Billy Keane would put Jamie Oliver to shame. And . . . he has a few words that Gordon Ramsey hasn't learned yet!! northkerryreachingout.com is the website of a voluntary organisation aiming at bringing the Kerry Diaspora home. Doneraile Literary and Arts Festival is all about the forthcoming Doneraile Literary and Arts Festival to be held in August. It includes information on Short-story and Poetry competitions.